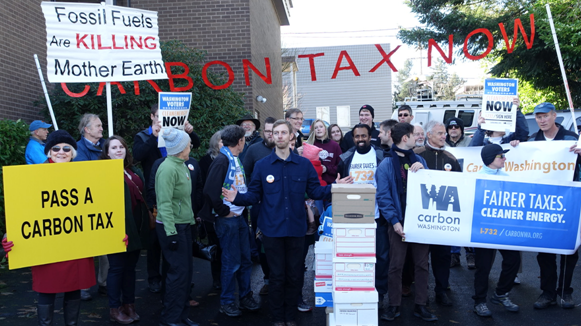 On December 30, a crowd of climate activists trooped to the office of Washington’s Secretary of State in Olympia, hauling boxes of signatures with a message from hundreds of thousands of Washingtonians: We want Washington to enact a carbon tax and make our state a U.S. leader on climate action. By filing the signatures before the year-end deadline, the group ensured that Washington must consider a carbon tax, either by a vote of the legislature or as a ballot measure in November. We first reported on Carbon Washington’s I-732 initiative last June, when the grassroots group had collected 50,000 signatures. Since then their campaign grew exponentially, gathering a total of 362,000 signatures and gaining prominent endorsements both locally and nationally. The scene in Olympia, the WA capital, on Dec. 30, 2015. The signature total far surpassed the 246,372 valid signatures required to advance the initiative to the legislature. In fact, it puts I-732 in Washington State’s all-time top 10 by most signatures collected. This is especially impressive given that Carbon Washington relied on volunteer labor and grassroots donations, disproving skeptics who said collecting the necessary signatures was impossible without at least $1 million to hire paid petitioners. Now Washington’s divided state legislature will consider the measure — the 2016 session runs from January to March. I-732 was designed to meet fiscal conservatives halfway; it is revenue-neutral, pledging carbon tax revenues to reduce the state sales tax. But while the measure has been endorsed by some prominent Republicans, including Harvard economics professor (and former Romney advisor) Greg Mankiw, it has yet to win support from Republican legislators. If the legislature doesn’t enact I-732, the measure will appear on the ballot in November, alongside what will almost certainly be a hotly contested presidential election. Advocates hope this will lead to higher voter turnout, especially among younger voters, which might boost the measure’s chance to pass. The number-one energy meme of late is “fracking changes everything,” with fracked oil and methane (gas) having turned the United States almost overnight into the world’s leading extractor of hydrocarbons and, perhaps soon, even a net exporter. And that was before Russia annexed the Crimea and muscled in on the rest of Ukraine. Now the chorus of voices calling on Congress and the White House to neutralize Vladmir Putin’s use of natural gas as a geopolitical weapon by making America the “arsenal of energy” for Eastern Europe, as a former Bush NSC official urged in the New York Times, has moved into the higher decibels. In the past week, the Times’ editorial board and the director of the Geopolitics of Energy Project at Harvard University’s Kennedy School have been among those urging stepped-up U.S. oil and gas exports (and, hence, more fracking). And that’s just on the center-lib part of the spectrum. Kentucky Senator Rand Paul is demanding approval of the Keystone XL Pipeline, and pretty much the entire U.S. Right wants our oil-and-gas spigot on full bore as well. “After Fukushima, Utilities Prepare for Worst,” announced the New York Times in a story timed to this week’s third anniversary of the Japanese triple reactor meltdown. The story described measures ranging from keeping earth-moving machines at the ready (to maintain plant access after disabling earthquakes) to stocking regional depots with tractor-trailers able to deliver emergency gear to stop reactor disasters from spinning out of control. A new paper, “Deficit Reduction and Carbon Taxes: Budgetary, Economic, and Distributional Impacts” by economists at the Washington, DC think-tank Resources for the Future, finds that a $30/ton tax on CO2 pollution would reduce U.S. emissions 16% by 2025. The report concludes that dedicating the carbon tax revenues, estimated at $200 billion each year, to “down payment” of the federal budget deficit offers greater economic-efficiency benefits than other revenue-return options. Moreover, according to RFF, using the carbon tax revenues to pay down the deficit would especially benefit the young, by curbing global warming and its associated future costs, and by reducing tax burdens of today’s young people far into the future. Using a new intergenerational economic model, RFF economists examined different ways to use revenue generated by carbon taxes, revealing the impacts of those choices across the age spectrum of the U.S. population. They modeled four scenarios: three in which the carbon tax revenues are used to reduce taxes on 1) capital, 2) labor, and 3) sales of goods, and a fourth in which the revenues are returned in lump sum “dividends.” RFF found the differences in annual aggregate welfare among the four options to be relative small ― less than 3 percent. Interestingly, returning revenue as lump-sum dividends offers a slightly more progressive income distribution than a labor tax shift. More striking differences are revealed across the age spectrum: people who are now too young to vote would benefit most from a carbon tax used to fund deficit reduction, according to RFF. The authors conclude: “[E]nacting such a policy [a carbon tax used to pay down the deficit] will be politically difficult unless current generations are altruistic” enough to act now to curb global warming and to pay down deficits, both of whose impacts will be greatest on the young. That’s an understatement. Which Carbon Tax: Robust or Miniature? Not all carbon tax proposals are equal. Some would raise the level of the tax robustly enough over time to transform the energy supply and the ways everyone uses energy. Others envision miniature carbon taxes meant to generate revenue targeted for specific purposes. The Breakthrough Institute (BTI) advocates a miniature version: a $5/T CO2 tax to fund energy R&D that they insist will unleash cheap new sources of low-carbon energy to undercut fossil fuels. In contrast, the Carbon Tax Center finds that a briskly-rising economy-wide carbon price is needed for energy efficiency and renewable energy to displace the vast bulk of fossil fuels by mid-century. 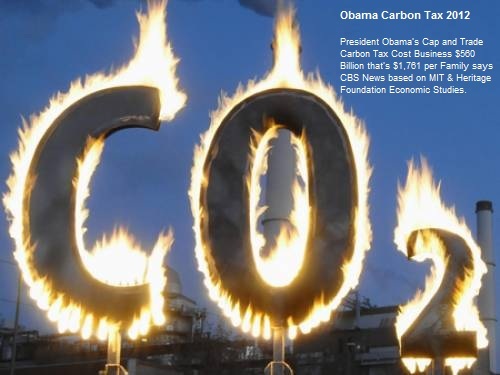 An excellent example is the measure proposed by Rep. John B. Larson (D-CT) in 2009 for a CO2 tax starting at $15/T, rising to more than $100/T over a decade, which we estimate would reduce U.S. CO2 emissions by one-third in that time. In rebuttal, Handley argued that taxing CO2 pollution instead of productive activity such as work and investment is a climate policy offering enormous climate benefits at little or no cost. Successful carbon taxes in British Columbia and Sweden are proof that voters can be persuaded to embrace carbon taxes that reduce taxes on individual and business income, retail sales and payrolls. These taxes, along with Australia’s new carbon tax, demonstrate that well-designed carbon taxes can effectively reduce emissions quickly, at minimal cost, without stunting economic growth. Handley further noted that the effectiveness of BTI’s proposal hinges on the ability (and willingness) of Congress and federal agencies to identify and fund nascent low-carbon energy technologies capable of breaking fossil fuels’ economic dominance. Yet a steadily-rising economy-wide carbon price can perform this task far more broadly and effectively, Handley argued, by encouraging every energy supplier and every energy user to look for ways to reduce emissions, spurring innovation across the entire spectrum of energy supply and use. He noted that diverting carbon tax revenues to R&D would preclude using carbon tax revenue to reduce other taxes, thus undercutting political support. “Viva Emissions Trading!” could have been the title for the World Bank’s oddly anachronistic, “Pricing Carbon To Achieve Mitigation” event at the bank’s Washington, DC headquarters Wednesday. Fortunately, after nearly two hours of genuflection at the altar of emissions-trading, Min Zhu, Deputy Managing Director of the International Monetary Fund, took to the podium to commit the apostasy of calling for simple carbon taxes. The opening panel featured officials from South Africa, South Korea, and China extolling “market mechanisms,” especially trading. In almost apologetic terms, the South African official described his nation’s carbon tax, assuring the audience that South Africa doesn’t intend to be left out of carbon markets. The South Korean official’s presentation indicated that the country has allocated 100% of carbon allowances in the first phase of its trading system but hopes to begin auctioning a small percentage of allowances in later phases, which will garner revenue. The Chinese official deflected a question about news reports that his country plans a carbon tax, emphasizing that China is establishing emissions trading so it can link with the European Union’s Emissions Trading Scheme (ETS). But, he said, carbon taxes are an “interesting alternative” that could play a role in the future in some sectors. In a later panel, an EU official trotted out the oft-repeated ETS “success story” that always seems to overlook its problematic volatility followed by extreme price decline. She admitted the ETS might need “some adjustments.” Finally, after three panels of babble about linked carbon markets, offsets, monitoring, reporting, verification, etc., it was Min Zhu’s turn to deliver the closing remarks. The IMF Deputy Managing Director struck a welcome new note, suggesting that the EU’s “collapsing carbon price” might be “cause for concern” and calling instead for a “crystal-clear, stable, credible carbon price” across sectors. Zhu recommended adding price ceilings and floors to emissions trading systems in order dampen volatility. He praised the IMF’s new compilation by Ian Parry et al., “Fiscal Policy to Mitigate Climate Change,” which emphasizes the revenue potential of simple, direct carbon taxes. Zhu also urged policy-makers to pursue broad, inclusive carbon pricing with consistent price signals and to refrain from allocating allowances, effectively giving away revenue. Continuing his revenue theme, Zhu closed by suggesting systematic review and overhaul of national tax policies to add environmental taxes, especially carbon taxes. Thank goodness someone near the top of global financial governance recognizes the importance of simplicity and transparency in climate policy.